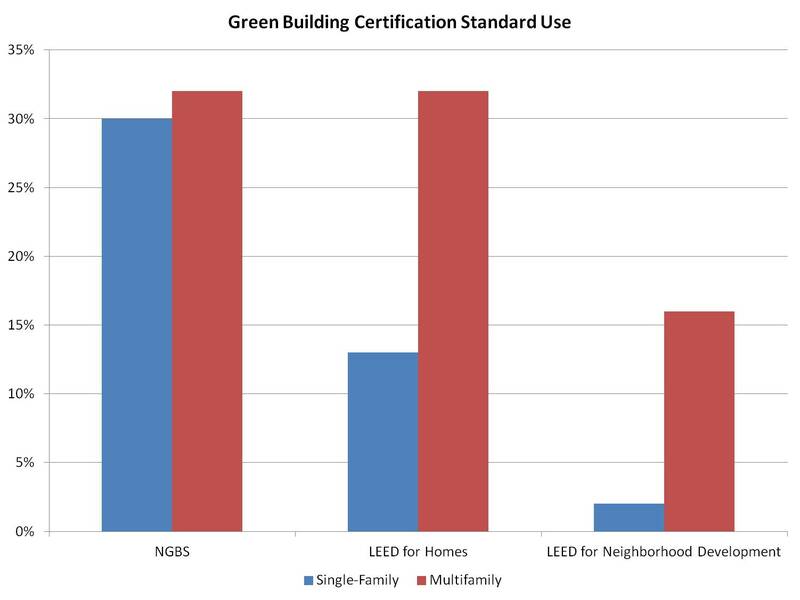 Among single-family builders, the National Green Building Standard (NGBS) is the most commonly used green building certification. McGraw Hill Construction’s data and analytics team surveyed a set of NAHB single-family and multifamily members in 2013. From 2011 to 2013, the percentage of single-family firms using the NGBS has grown from 21% to 30%. In contrast, 13% of single-family builders reported use of LEED for Homes. Moreover, for firms with an active focus on green construction (for whom more than 30% of their operations involve green construction), almost 50% are using the NBGS. For multifamily firms, the survey indicated greater use of the various LEED standards. LEED certification has high visibility in the commercial real estate sector, which may explain its use in the multifamily area. The survey found that 32% of multifamily firms were using LEED for Homes and 16% LEED for Neighborhood Development. 13% of multifamily firms reported using the NGBS.